Each summer provides us with an opportunity to curate an exhibition with artists whose work we find particularly compelling and to provide ourselves with an opportunity to live with that work. For the exhibition we pursued work that is formally fresh and simultaneously radiating content and ideas. 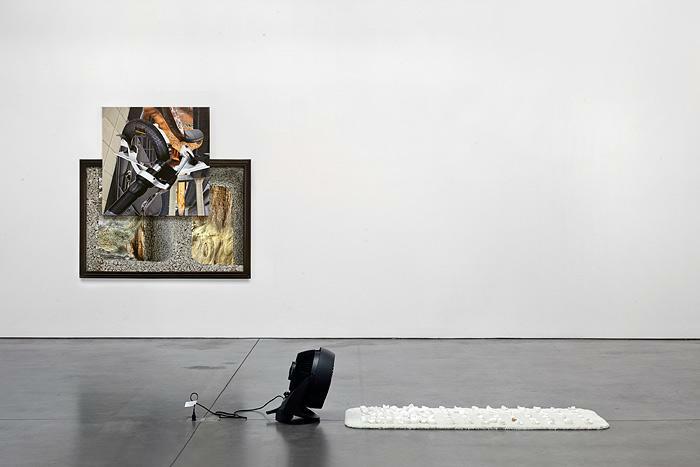 While the show was not originally thematically driven, it became quite clear that even across such different media and techniques, the works in the exhibition all address the differences between three-dimensional space and two-dimensional representation and in that questioning begin to collapse the boundaries between material and fictive space and the imaginary and the real. Even as each artist maintains his or her own territory, this idea has become the unexpected core of the exhibition and we then were specific about selecting works by each artist that emphasized this relationship. For instance, by being installed in quantity on the floor, Andra Ursuta's work Ethnic Bimbo, 2012 transforms cards printed with a photographic image into a work that has a spatial quality in the exhibition space and a phenomenological relationship to the viewer. Lizzi Bougatsos' found poster works become sculptural in their incorporation of both found and hand made elements. While all of the pieces are quite formally resolved, each has an eccentricity that brushes up against the content of the work. 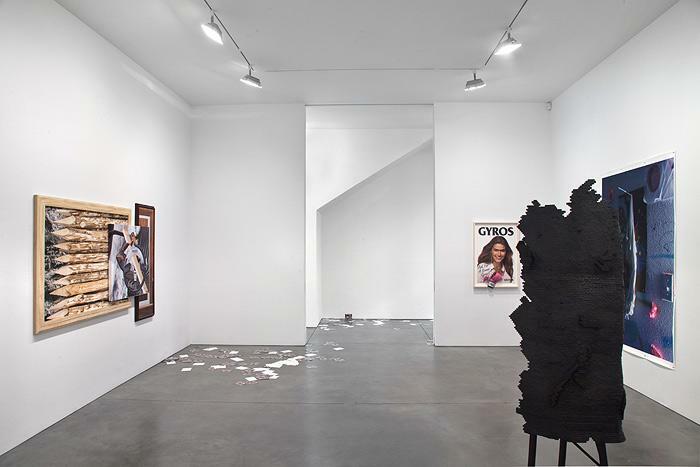 All of the artists in the exhibition work across varying media or make work that straddles different disciplines so while medium is intrinsic to each work, whether formally or conceptually, materials are not fetishized. This specificity of medium is a central value that has guided the gallery's programing from its inception. In a time when it seems increasingly that artists have become obsessed with genuine yet meaningless gestures, we are especially pleased to have a show of work that is full of ideas and yet still evinces the hand of the artist without craft and labor becoming the sole subject of the work. For each artist, we have attempted to have enough examples of his or her work to allow viewers an opportunity to feel as though they can have an understanding of the artist's broader practice. In the process of installing the show, it became clear that we could have installed the works in a dozen ways with pairings and placement of different works highlighting a number of intended and unexpected juxtapositions that emphasize material, ideas about materials, and formal coincidences between works. Yet, as exciting as it is to see dialogues emerging between works by artists with very different conceptual and physical practices and to use this exhibition as a way to imagine other possibilities in this regard, ultimately for each of these artists we wanted to have an opportunity to more deeply engage with his or her work. 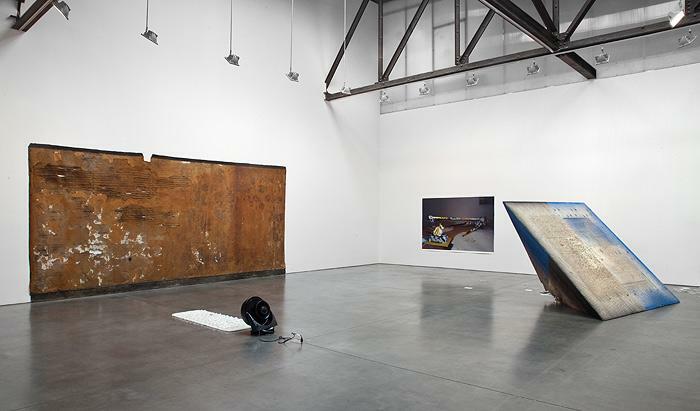 Bougastos' wide-ranging practice encompasses sculpture, collage, installation, writing, and performance. Her work appropriates the cultural and commercial detritus of the present in both material and subject. Found posters and advertising are often re-purposed with painted or collaged elements to both undermine and reveal the narratives that are woven into the visual fabric of the city and popular media. Bougatsos' practice is deeply responsible to the politics of media representation and does not shy away from referring to the troubled state of our current situation. Bougatsos' work frequently employs comedy and its humor is both disarming and a means to frankly comment on the moment in which we live. By manipulating familiar, ordinary materials Bougastos' work hints at the strangeness of what lies behind closed doors. 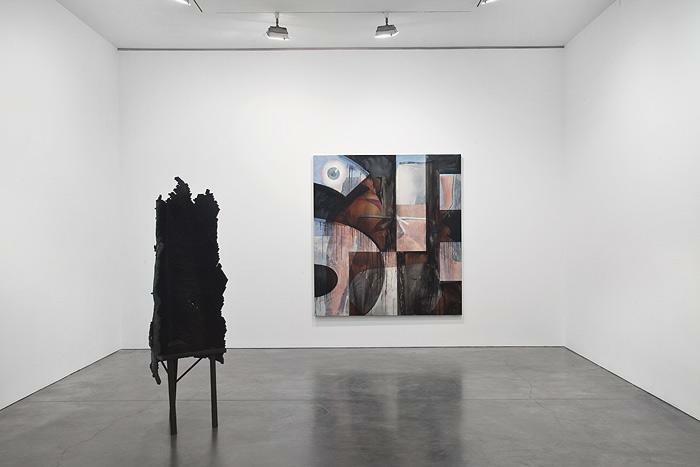 Working primarily in sculpture, drawing plays a central role in DeLucia's practice. 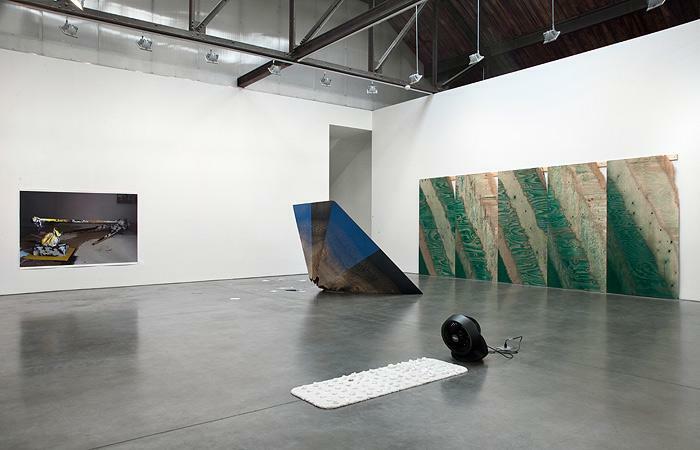 In his most recent work, DeLucia uses digital software and architectural CAD programs to create a computer model of a three-dimensional object, which is then given physical form on variously painted or poster covered plywood using a computer-controlled router. DeLucia's work reveals how objects are increasingly mediated by images or digital rendering and how the perception of these models as real objects is illusory. By applying these models back onto material planes as reliefs or simple geometric forms, DeLucia's work reveals how a computer model or one carved into plywood are ultimately comprised of the same information. By undermining the desire for ideal forms DeLucia shows how the purposeful variation of materials leads to an individualistic and interpretative process. Usually taking the form of large format photographs, Gilbert's work is fused to the material world. In an exhibition that focuses on materials and process, Gilbert's work is compelling in the way that the photographic medium can be used to intensify our experience of sculpture, material, and space. The subjects of his photographs are sculptural installations and arrangements made from humble materials like paper, twine, paint, and scraps of fabric. These installations are then photographed under dramatic, chiaroscuro lighting. Gilbert mines the transformative potential of photography to monumentalize these seemingly delicate constructions. Gilbert's process blurs the boundaries between photography, painting, and sculpture and reflects the increasingly loose distinction between the material world and the world of images. Fitch composes works that are manifestations of an image and material culture increasingly defined by the edit, the sample, and recombination. Fitch procures stock images of tools and building materials which are used as raw material and then printed on canvas and either framed in wall bound constructions or draped over sculptural assemblages. The shiny, hyper-real quality of the images betrays their origins in the digital world and points to the use of digital tools (software) that create the structure and limits for production and simultaneously generates and confines meaning. Fitch's work is often quite funny with sometimes absurd juxtaposition of objects and images. Appropriating materials from a culture increasingly structured by overwhelming consumer choice and the ethic of browsing, Fitch finds ways to transform the banal and generic into works defined by their strangeness, specificity, and unique subjectivity. Fitch is also well known for her collaborative practice with Ryan Trecartin and we are excited to have an opportunity to show Fitch's individual work. 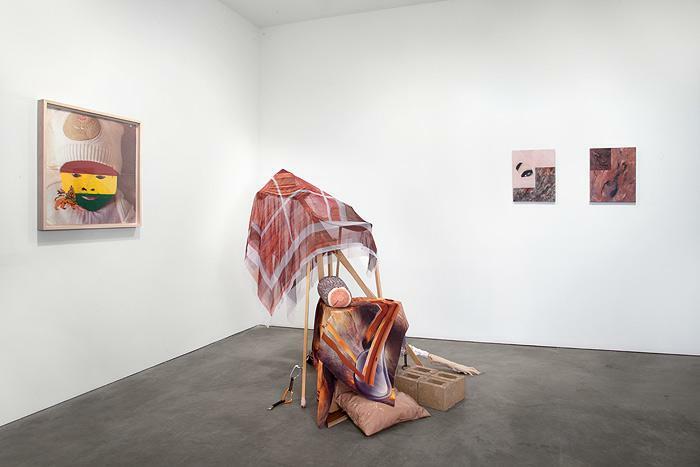 While the collaborative practice of Fitch/Trecartin emphasizes a sense of immediacy both in accumulation of objects and the rawness of material, Fitch's solo works exhibit a high level of skill and production that creates a level of comfort around the work to allow for a greater eccentricity in the imagery itself. Fitch's work strategically utilizes form and order so that strangeness and chaos can emerge with more intensity than from an undifferentiated field of disorder. Overby has an extremely deep practice that was surprisingly unknown during his lifetime. While Overby was a widely known figure in the Los Angeles art world and a highly successful graphic designer, many did not realize he had a fine art practice until after his death. As the one historical artist in the show who is no longer alive, it is especially interesting how his work has an uncanny and specific relationship to each of the other artists' works in the show. It is partially for this reason, but also in the interest of showing the diversity of Overby's practice, that we have chosen to show the radically different types of work that Overby made, sampling an array of modes of art making from the 70s and 80s including post-minimalist sculpture and figurative, large-scale paintings. Remarkably, despite the heterogeneity of Overby's oeuvre, was his ability to work so masterfully in each media. Overby's PVC, latex, and cloth works are examinations of architectural space, notably the burned out remains of The Barclay House in Los Angeles. Overby's casts of the space, however, were always tied intrinsically to the body and the walls of the house take on a resemblance to skin and flesh. Overby's paintings, similarly depict the human form but through the lens of advertising and media. His work melds the late 80s interest in figuration to the critical position of Pop to media imagery. Ursuta's work explores the precarious position of the individual navigating public and private histories, and collective and personal cultures. In many of her works, it is the body and often the body of the artist that becomes the site for these anxieties to unfold. Ursuta's practice frequently represents a kind of obsessive handicraft whether in her ongoing series Man from the Internet where she carefully renders in ink a found internet image of a dead body from the Chechen war, with the intent of ultimately generating 100 drawings, or in the thousands of hand cut wooden bricks that comprise her work Untitled (Masothrone), 2007. Ursuta's work often employs a wry humor that lends her work the playfulness of a Dadaist enterprise while investigating the boundaries and limits of personal identity.